Anyone who’s ever had the misfortune of a conversation about movies with this blogger is no doubt aware that I like musicals about as much as I like biopics. That is to say, not very much. I do, however, love Tim Burton, and count Ed Wood among my personal favorite films. So if he could make a biopic I can love, I didn’t think it unrealistic to hope that he might melt my cranky moviewatcher’s heart with a musical. But it’s been a long time since Burton has directed a personal project, instead working on existing franchises and remakes like Planet of the Apes and Charlie and the Chocolate Factory. He did add a healthy dose of the trademark Burton flavor to each, not to mention key members of his troupe (Helena Bonham Carter in Apes and Johnny Depp in Charlie), but fans like myself are still waiting for the next burst of pure Burton madness in the spirit of Edward Scissorhands. The Sweeny Todd tale originated in a prose serial form in 1846, and after several permutations, eventually became a stage musical by Stephen Sondheim in 1979. Burton’s 2007 film adaptation doesn’t quite manage to break free of its stagebound, er, staging. Despite the opportunity a film has to expand a play’s world, the action is limited to just a few locations. The rich art direction doesn’t defeat the impression that the whole thing was shot on a small soundstage. Speaking of art direction, Burton’s vision of late 19th century London is very colorful, provided that that color is blue. That said, it isn’t long before a few generous gallons of red are splashed about the place. Timothy Spall, once of Mike Leigh’s British kitchen sink dramas, continues to indulge in the new scenery-chewing persona he developed as Peter Pettigrew in the Harry Potter films. 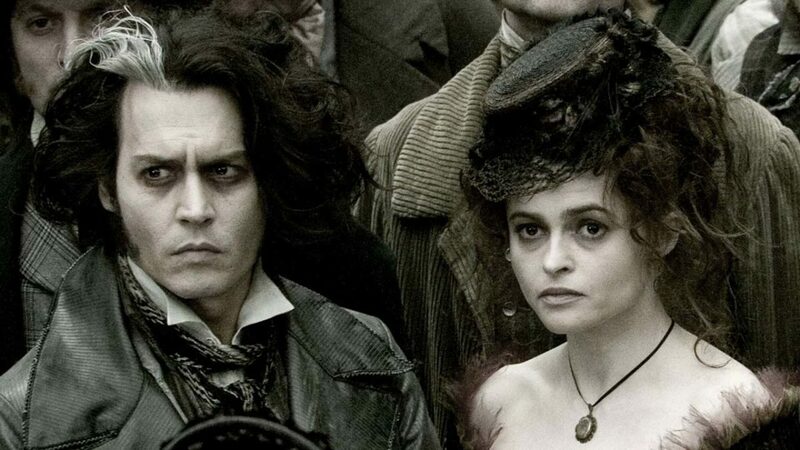 Helena Bonham Carter looks like she just stepped out of The Nightmare Before Christmas, and Sascha Baron Cohen sports no less than two outrageous accents. 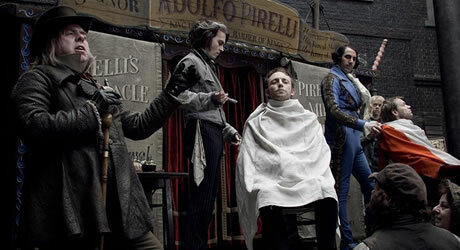 Sweeney Todd: The Demon Barber of Fleet Street joined Waitress in the most unlikely mini genre of 2007: movies about pie shops. But while Waitress was a largely cutesy concoction, Sweeney Todd adds to the recipe a preoccupation with vengeful cannibalism a la The Cook The Thief His Wife & Her Lover. And finally, a technical note: the DVD edition suffers from an unusually uneven audio mix. The music is far, far louder than dialogue sequences, so be prepared to drive your remote control volume switch throughout.